Following a swathe of moderate to heavy snow as a result of winter storm Jayden overnight tonight and through Monday for portions of the plains, Minnesota, Wisconsin, Northern Iowa & Illinois, and Michigan, before funneling up inland portions of the North East late Monday and into Tuesday, and then a severe and potentially record breaking cold outbreak is forecast for many areas. We’ve been warning of it for a few days and now it’s looking likely to happen. Into tonight snow will form over Minnesota and eastern North & South Dakota before spreading into Minnesota, Wisconsin and northern Iowa/ northern Illinois through Monday giving heavy accumulations in places. Later on Monday heavy snow will fall over Michigan with some lake effect enhancement from lake Michigan. Rates of between 1 and 2 inches of snow per hour will likely remain manageable for the area. Later on Monday the snow will spread across the lakes into southern Ontario giving 4-8″ widely. Later on Tuesday snow will head into parts of the north east and could intensify over New England and Maine giving 8-12″ in places especially northern Maine. On Tuesday some moderate wet snow will fall over parts of northern Mississippi and through the Appalachian mountains and across inland parts of the North East like Pa and New York state giving accumulations of 1-4″ widely. Intensification likely in the North East later on Tuesday: The GFS and NAM model are suggesting intensification of the weather front associated with Winter Storm Jayden later on Tuesday which could produce more intense snowfall rates of 2 to 3 inches per hour in a corridor from lake Ontario through upstate NY, Vermont, New Hampshire and into Maine. If this occurs, some significant totals could develop here towards 1 feet (12″) in places. Keep an eye on NOAA warnings & local forecasts for this potential risk. Now for the biting cold. Prepare for the life threatening freeze that will set in through Tuesday into the mid west and extend into the western Great Lakes later in the day. For some parts of the Mid West late Monday through Thursday the air will be the coldest it’s been for a couple of decades. Freezing pipes & a significant risk to the vulnerable of society. Please make necessary preparations for the extreme cold. This entry was posted in North America 2019 on January 27, 2019 by admin8. 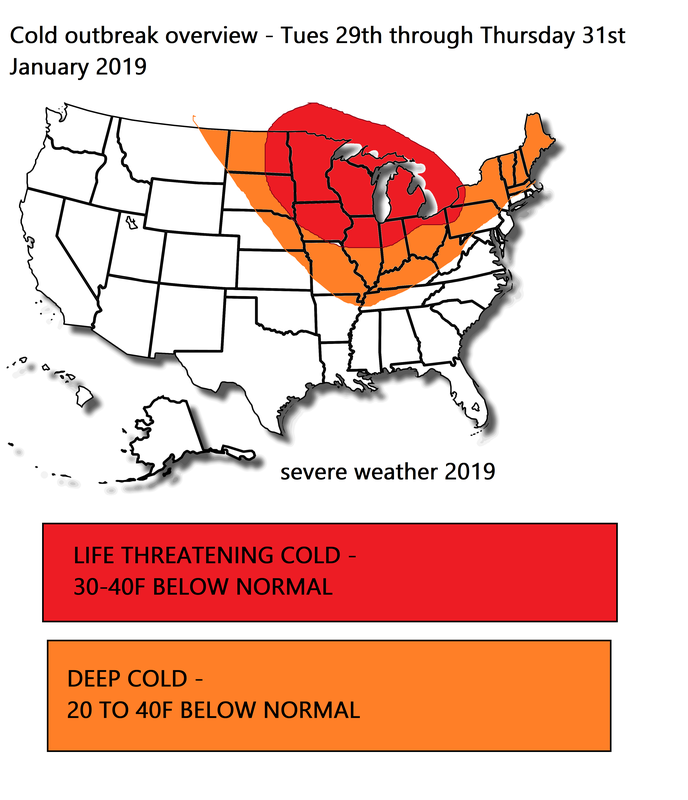 A bout of exceptionally cold, life threateningly cold air is forecast to fall down from the Arctic into many central parts of the states with extreme cold during the early and middle stages of next week, courtesy of a piece of the polar vortex.. 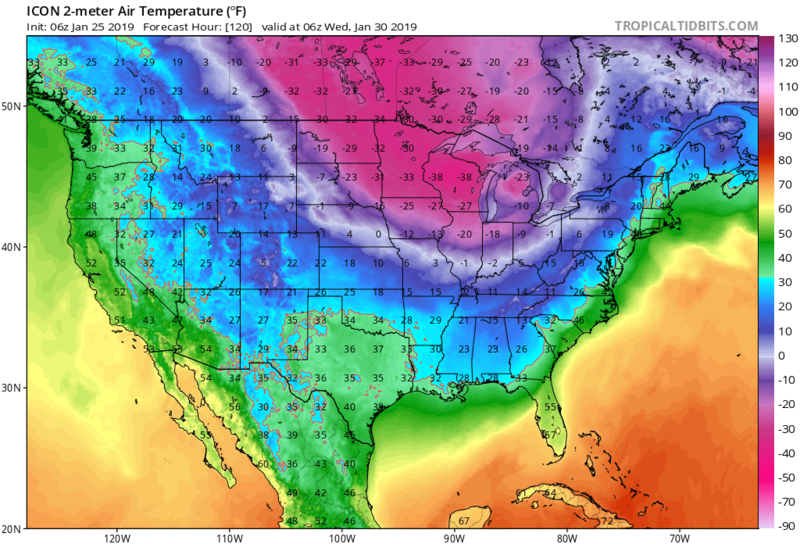 The mid west, western parts of the great lakes will feel the chill to begin with before the exceptionally cold air infiltrates further east towards the north east later in the week, however this cold snap will peak on Tuesday / Wednesday for the western lakes, Mid West. In some parts of the interior and upper Mid West the air could be at temperatures not seen here for about 2 decades! 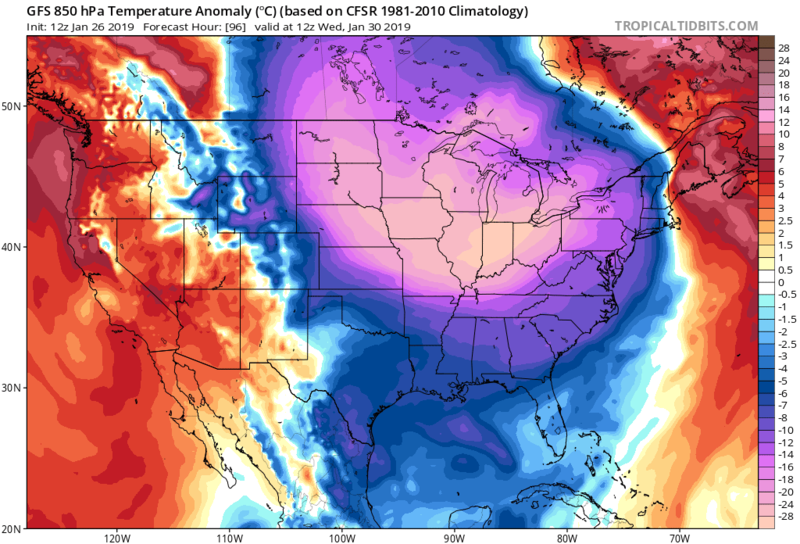 Chicago all the way up to North Dakota through Minnesota, Wisconsin will be hardest hit by this Polar Vortex outbreak. Even though the dangerous cold will be further north, in the plains, mid west, lakes & north east, much colder than average temperatures will be apparent further south to with much below average temperatures reaching the Gulf Coast by Wednesday. This is life threatening cold. 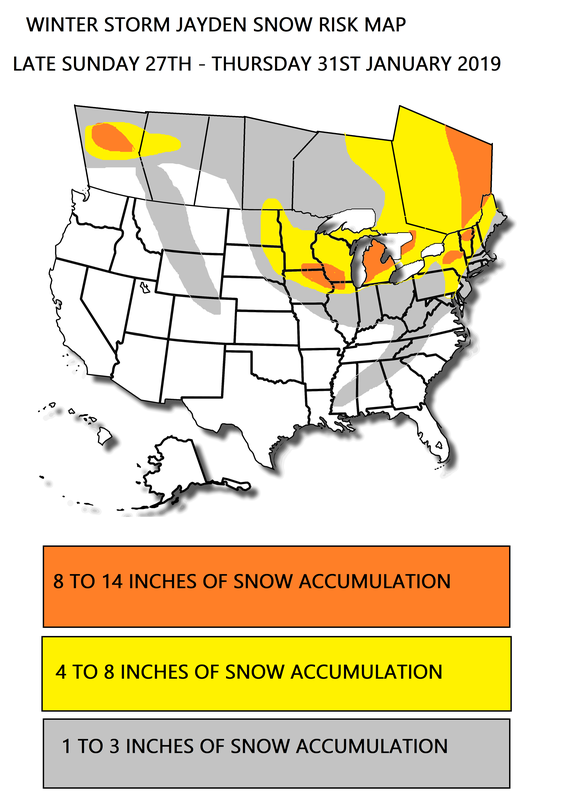 A swathe of moderate snow with rates of 0.5 to 1.5 inches per hour for a few hours will spread from west to east forming over North Dakota on Sunday night, into Minnesota, Wisconsin, the western Great Lakes & northern Illinois on Monday with 5-10 inches of snow before affecting the great lakes progressively from Monday into Tuesday. By Tuesday some light to moderate yet persistent snow will be affecting the upper north east. There could be a swathe of snowfall way far south possibly as far south as Mississippi on Tuesday! One to watch. Snowfall totals from this expected snowstorm late Sunday through late Tuesday are expected to be quite high for many, although some changes could occur it’s likely that some parts of say NE South Dakota and western Michigan could near 1 ft (12 inches) with 4 to 9 inches typical for many. Even as far south as Northern Mississippi could see a couple inches. Once again the east cost may miss this storm. 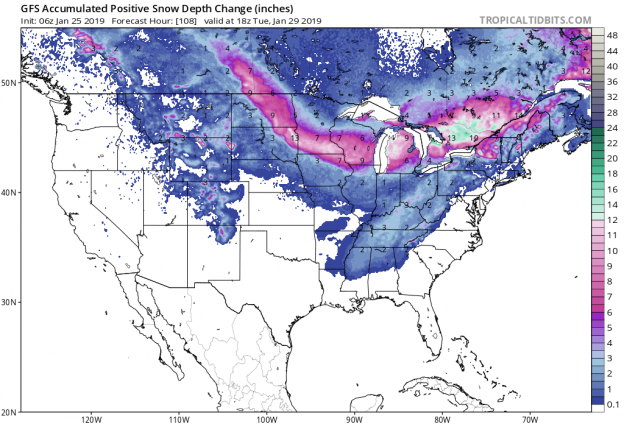 Image: Snowfall totals by late Tuesday as forecast from the GFS weather model (source: tropicaltidbits.com) as Swathe of moderate snow produces a widespread 6 to 12 inches from North Dakota, to northern Illinois and up to Montreal by Tuesday; although the positioning of this could change. This storm is far from being “sorted out”, in terms of it’s intensity and exact details with regards to timing and areas affected. However it could definitely be a significant and disruptive snowfall for many. Once this system is out of the way through Tuesday night we start to infiltrate extreme cold into the mid west, plains etc. Day time highs of -20C / -4F likely for large metro areas such as Chicago on Wednesday with dangerously cold windchills biting the plains, mid west & lakes through the remainder of Wednesday and into Thursday. This is proper cold, for some the coldest in a few years. Meanwhile moderate to heavy lake effect snow showers will be affecting the lakes with a further 6-12 inches in a few spots. Winds could be straight westerly which could pile the showers into places like Buffalo, Erie potentially, and central Michigan. Following this week we need to be on watch for more snow events and winter storms later next week into the weekend of the 2nd and 3rd of February as the cold pattern potentially gives way to something less cold further west, however this change could produce a snow event. Stay safe! This entry was posted in North America 2019 on January 25, 2019 by admin8.